On Dec. 24, 1920, an item in the Chattanooga News announced that the Soddy Banking Company planned to erect a new building since the existing building on Wall Street had "become inadequate to handle [the bank's] increasing business." Established in 1911, the bank had "been very prosperous" for the previous few years. A story in the Chattanooga Times five years before reflected such prosperity, reporting on the impending construction of a hosiery mill, the organization of the Soddy Telephone Company, and the local Durham Coal and Iron Company employing about 500 miners. The leadership of the bank included its cashier, W.H. Crow, who moved to the town from Birchwood in 1915. Crow built a home in Soddy, became politically active, and was known as Squire Crow, being a member of the County Court (effectively the County Commission in today's terms) from 1918 to 1926. By late January 1930, the prosperity of the small town of about 1,950 residents had faded. The stock market crash in October 1929 launched the financial spiral that started the Great Depression. The Durham Coal and Iron Company went out of business that fall. The only industrial concern still going in the small town was the hosiery mill, and "from this industry the business the town was said to be kept alive." Further, there were conflicting indications about the continued viability of the Soddy Banking Company. On the one hand, state bank examiners had been in the bank in late 1929 and found no issues, and at a mid-January board meeting of the bank, Crow reported that the bank was in good shape. On the other, an effort was made in the previous weeks to sell the company to Hamilton Bank in Chattanooga, which declined the transaction because of the "industrial reverses" in Soddy. On Jan. 24, a Friday, Crow purchased a bottle of carbolic acid from a druggist in Soddy and departed for Kissimmee, Fla., where his parents lived. Either intentionally or accidentally (Florida authorities determined it was the latter), Crow ingested some of the poison and died early on Jan. 28, a Tuesday. But also on the 24th, the county trustee at the Hamilton Bank tried to cash a check drawn on the Soddy bank. That was refused, and when the check was presented at the Soddy bank on the following Monday, it was dishonored. Crow was notified and promised to return but died the next day. Crow had apparently concealed the true status of the bank from its employees. The directors of the bank notified the state superintendent of banks that it could no longer meet its business in due course and asked that the superintendent take over its affairs for liquidation. Rumors ran rampant, the wildest of which was that Crow had faked his death to escape prosecution. A bank in neighboring Daisy had to be closed for a few days because of fears that it, too, was insolvent. The loss was attributed to Crow's bad investing, such as in peach orchards, or having secretly spent the missing money in "fighting a political faction." Money was supposedly lent without collateral, and the closing of the Durham Coal and Iron Company was considered to be a factor in the bank's failure. While a number of creditors, such as the county trustee, were secured by bonds, a great number of small depositors suffered loss, some to the point of destitution. Newspaper accounts noted the losses of a disabled miner and a Presbyterian minister and stated that school teachers seem to have been particularly hit hard. Reportedly, depositors eventually got a small percentage of their monies back in the liquidation. 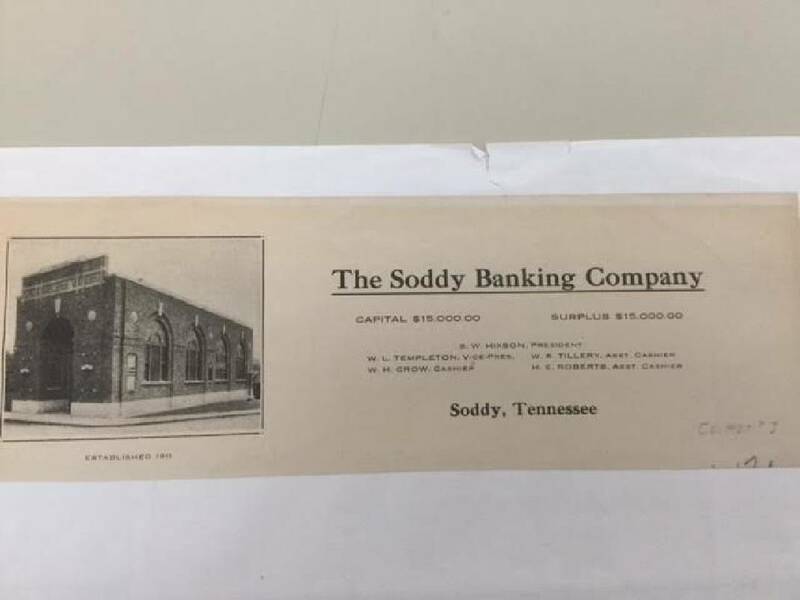 The elegant Soddy Bank building remained, but it never again housed a bank. It served for many years as an appliance store and later as a photography studio. Happily, in approaching its 100th birthday, the building has been put to use as a local history museum operated by the Soddy, Daisy & Montlake Historical Association. The museum opened on July 1, 2017, and will close on Dec. 23 so that new exhibits can be readied for a reopening in the spring of 2018. Sam D. Elliott is a local attorney and a member and former chairman of the Tennessee Historical Commission. He is the author of a new book, "John C. Brown of Tennessee: Rebel, Redeemer and Railroader." For more visit Chattahistoricalassoc.org.